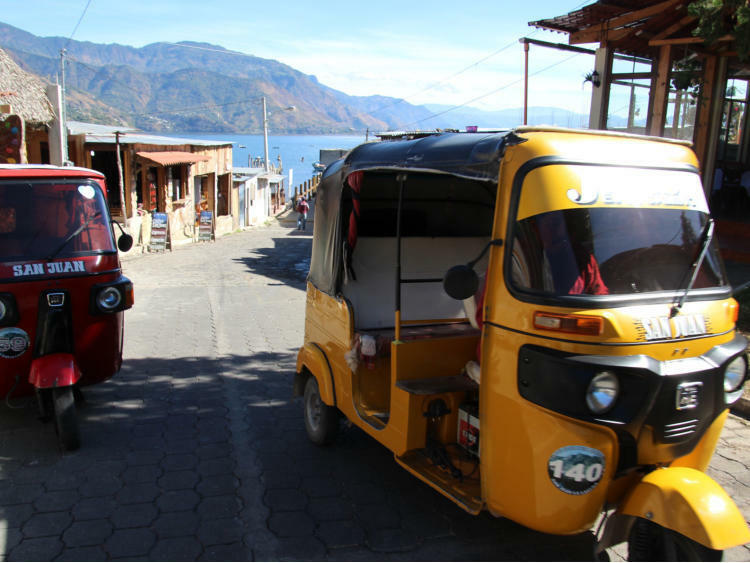 Around the shores of Lake Atitlán are a dozen Mayan villages where life and customs have changed little over the centuries. 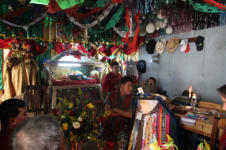 65% of the population is Mayan with each village having its own colour costume. 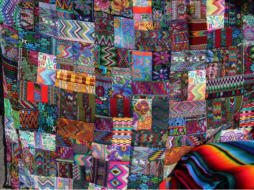 Textile weaving has been an important part in Guatemala’s indigenous K’iche culture for centuries, and the region is renowned for its unique fabrics and complex use of color. 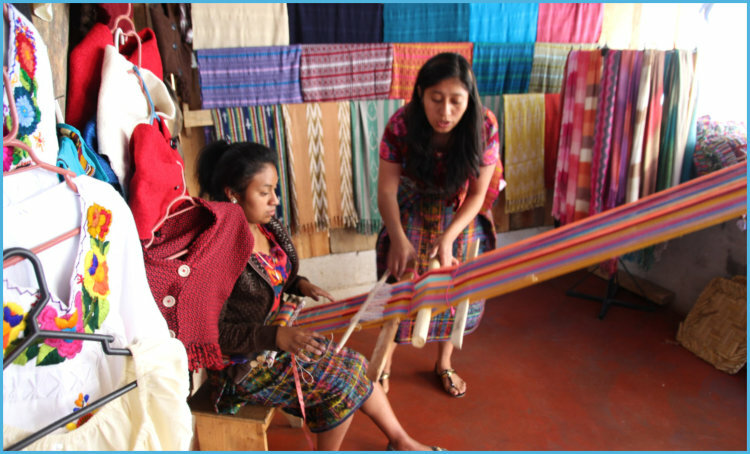 Weaving is done by K’iche women on backstrap looms, with each village and family retaining its own distinct weaving patterns, motifs, and colors. We went by boat to visit some of the villages. Lake Atitlan Santa Catarina Palopó is a small, quiet, indigenous village with many shops and stalls filled with art, weavings and fabrics. 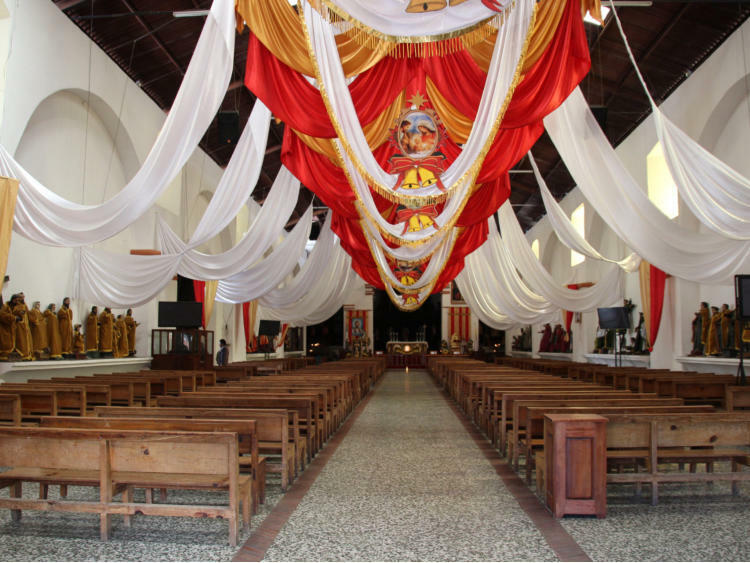 There is a large church in the centre and a lane lined with stalls that leads to the waterfront and the Hotel Villa Santa Caterina, where we stayed. 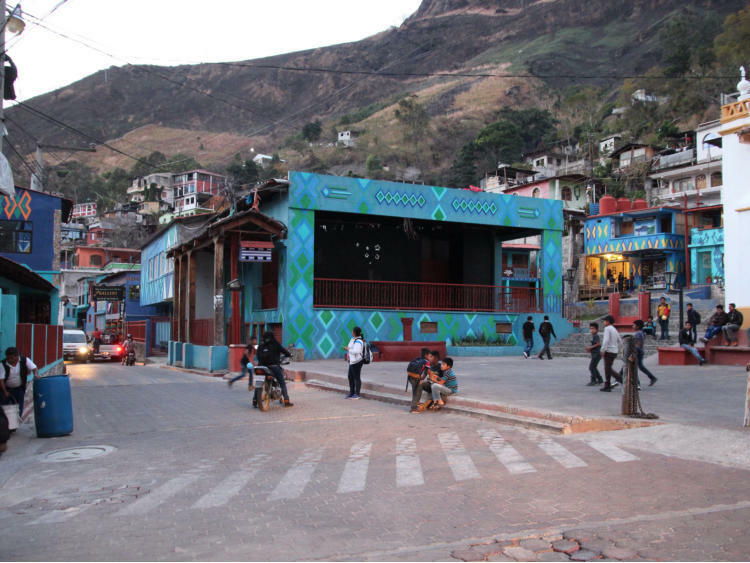 The locals are very friendly, The people of Santa Catarina Palopó are embarking on an ambitious project to turn the village into a monumental piece of artwork, with a view to generating an alternative source of tourism income for locals. 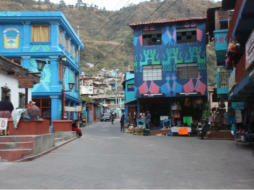 The buildings are all being painted in vibrant colours. One of Central America’s largest cement companies donated lime to manufacture paint. A wall surrounding the football pitch was used to experiment with colours, and a plaza became a design prototype. There are 800 houses and enough paint for 100 so far, so an “adopt-a-house” scheme is being set up. Each family can choose from five colour combinations and a series of stencil designs, all based on their traditional huipil tunic. Our first stop was San Juan which is populated by Tz’utujil Mayans. 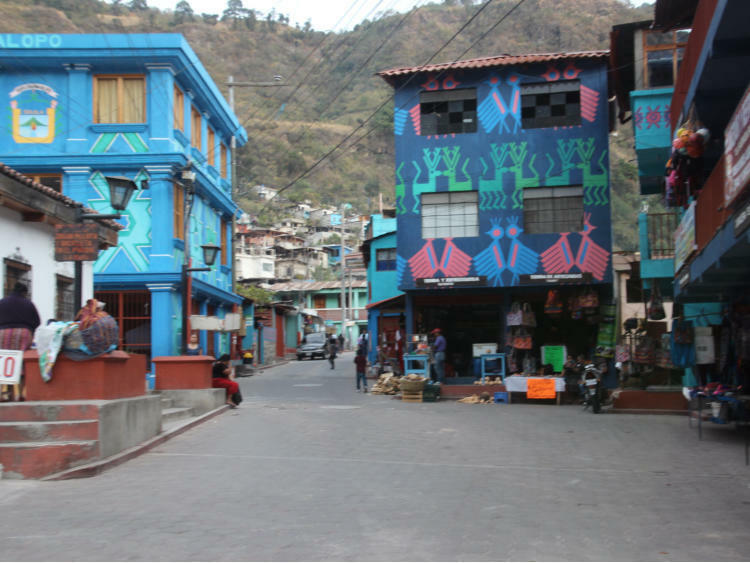 The town is well known for its weaving and textile co-operatives in which all natural dyes are used. 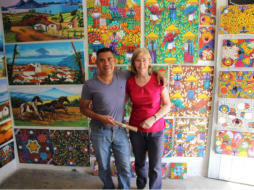 We had a demonstration of the coloured cotton dying and weaving techniques. 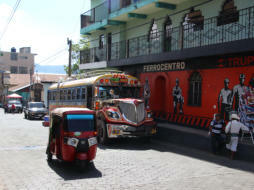 Santiago Atitlán is the most populous town and the majority of residents are indigenous Mayans (mostly Tz'utujil, some Cakchiquel and Quiche) . 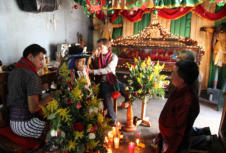 Many Atitecos (as its people are known) adhere to a traditional Tz'utujil Maya lifestyle. 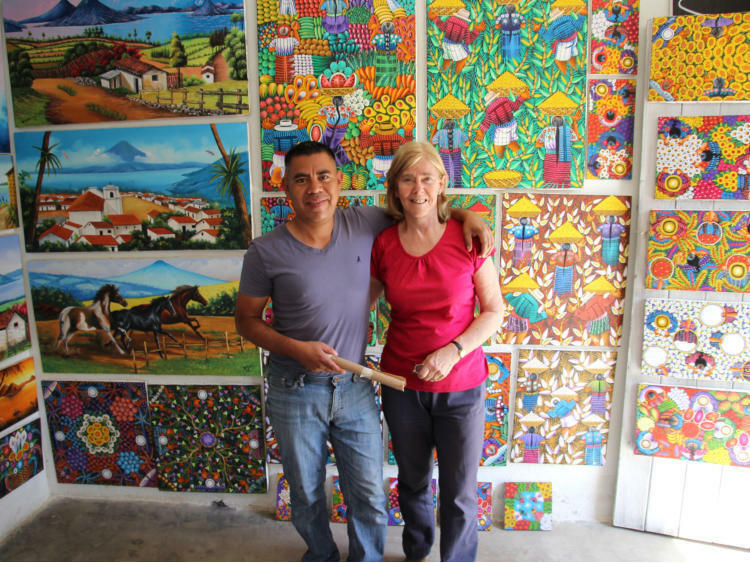 Women wear purple-striped skirts and huipiles (a loose- fitting tunic) embroidered with coloured birds and flowers, while older men still wear lavender or maroon striped embroidered trousers. As well as the arts and crafts, boatbuilding is a local industry, and rows of rough-hewn Cayucos (dugout canoes) are lined up along the shore. 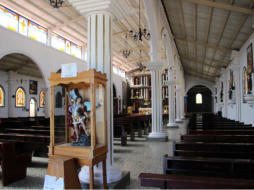 We visited the historic 1571 church, one of the oldest in Guatemala, where both Catholics and Mayans worship. 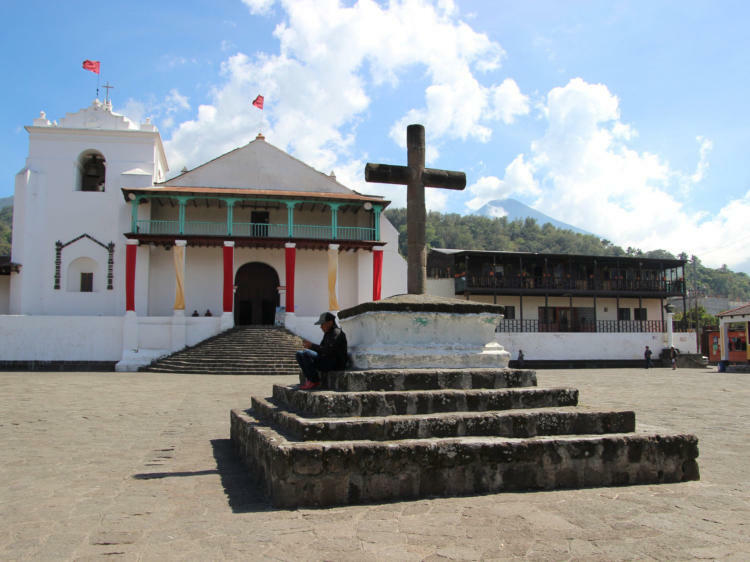 Santiago Atitlán was the site of considerable state-sponsored violence during the country's civil war. 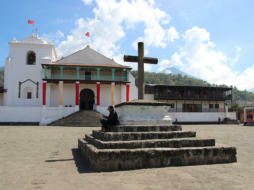 Some of the most notable incidents that occurred there include the assassination of an American Roman Catholic priest, Stanley Rother, by right-wing death squads on 28 July 1981, and the massacre of 14 people (and wounding of 21 others) when the Guatemalan Army opened fire on a crowd of unarmed civilians on 2 December 1990. 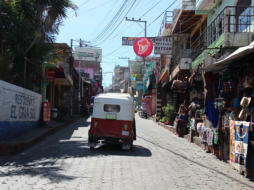 Panajachel (often known as Pana) was our last stop. 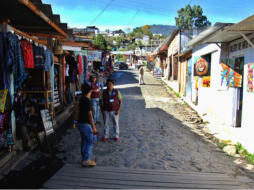 It’s the busiest and most built up of the lakeside villages with a population of 15,000 mostly Cakchiquel Mayans. 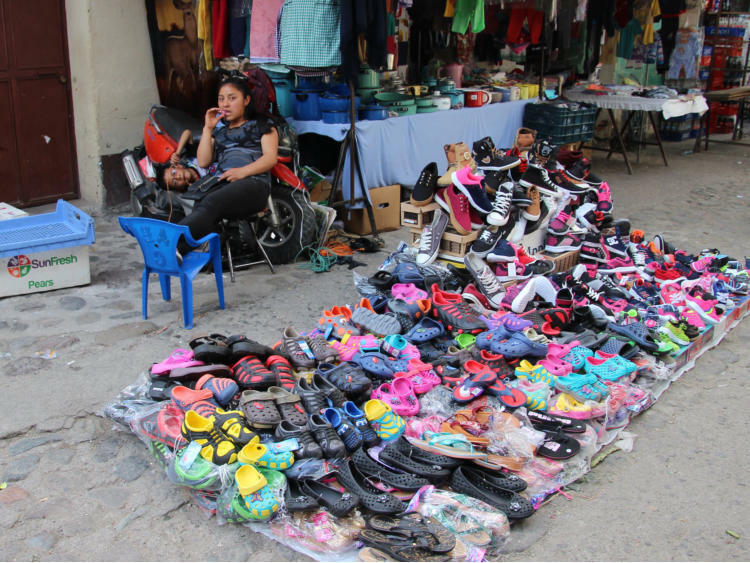 It’s a tourist town with the long main street, Calle Santander, is crammed with cybercafes, travel agencies, handicraft stalls, rowdy bars and many tuk-tuks. 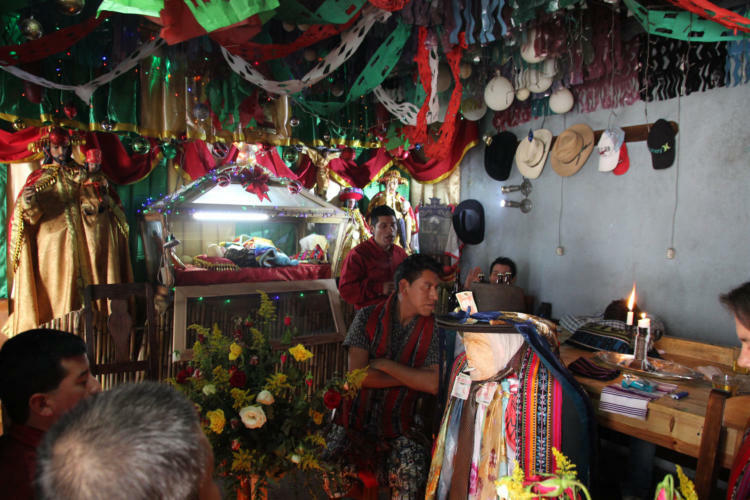 We visited the shrine to Maximón, a colorful pagan saint, which is situated in a highly decorated room of a neighbourhood house. 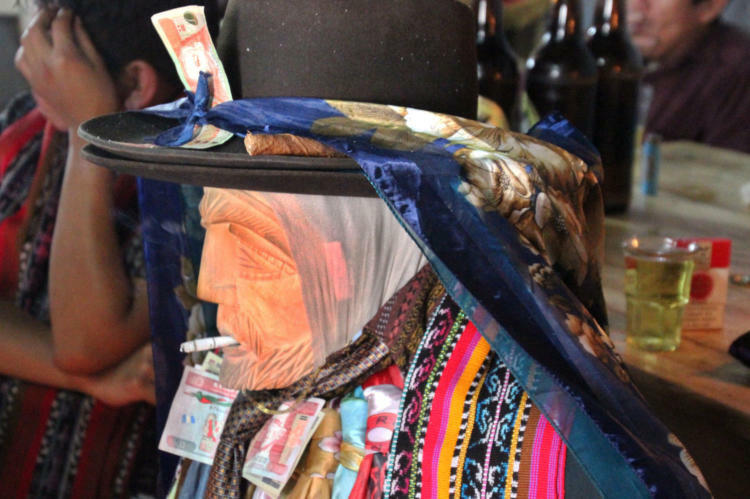 The wooden Maximón is dressed in both traditional Mayan clothes and modern garments and adorned with many colorful scarves, which are often gifted as a gratitude and thanks by those who receive healing and blessings from him. He almost always has a lit cigarette or cigar in his mouth. It is said that he can rid you of your vices (rather strange since he smokes cigarettes and people donate alcohol to him). It was equally bizarre that in the room, alongside, was a full size effigy of Jesus laying in a glass coffin. Maximón is ceremonially moved to a new home on May 8 every year (after Semana Santa). There is a rotation of 12 different villages. 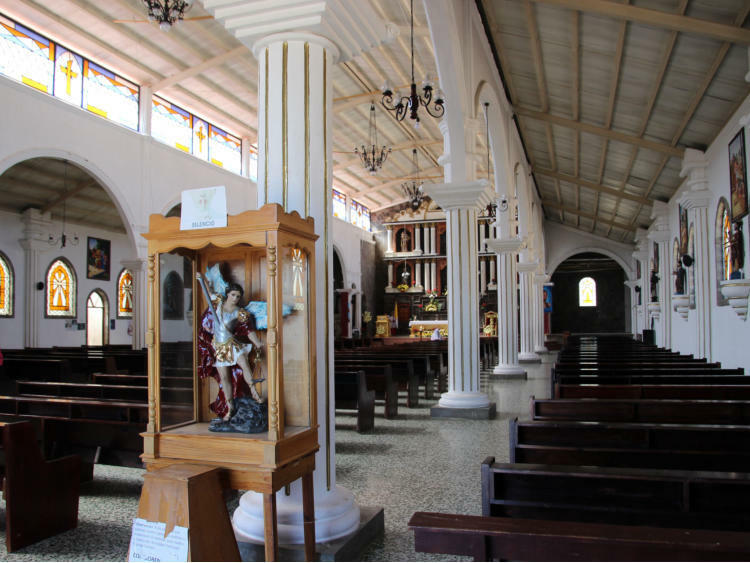 In the house where he resides there is a caretaker called Cofrades) who receives all the offerings. The continual receiving of offerings of alcohol and cigarettes is done to honor him, feed him, and ask his favor. 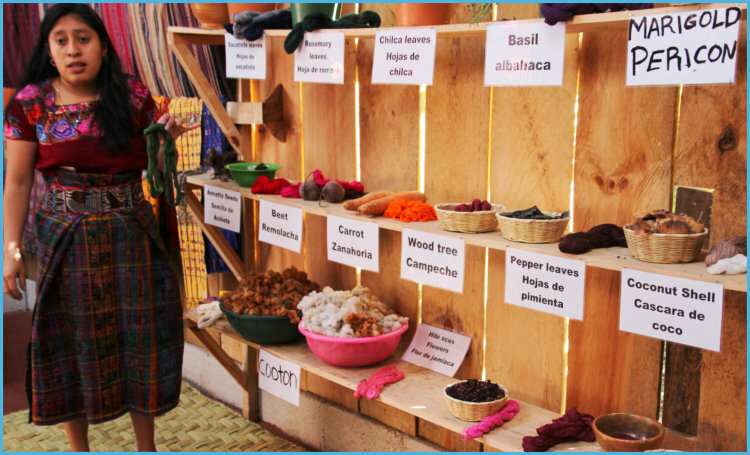 The raw cotton is wound onto a spindle and then wound into a coil that is dipped into the dye. 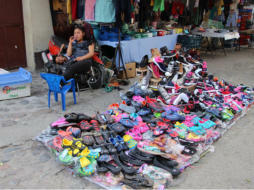 Various plants are used as dyes and the trunk of the banana tree is used to set the colour. 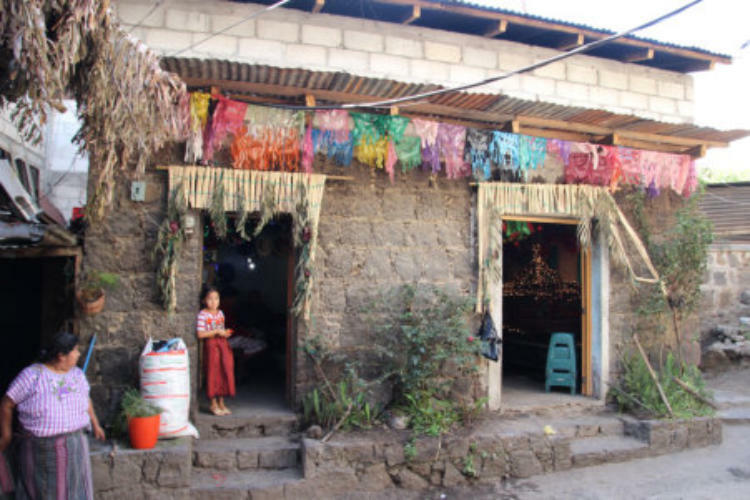 The weave is hung from a high point and secured around the waist of the weaver. The first wash of a dyed cloth should be in salt and vinegar to prevent the colours from running. The water level has risen 18 feet since 2010 with many buildings submerged in the water. 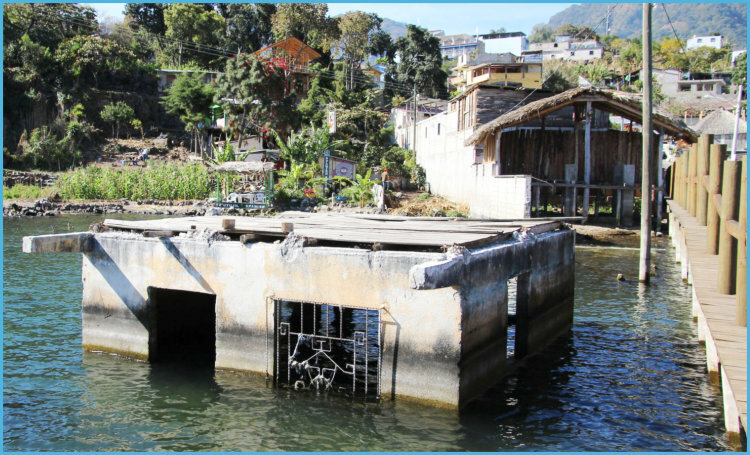 It is thought that increased sediment (due to deforestation, landslides and agriculture), blocks the volcanic fractures that allow natural drainage out of the lake into groundwater aquifers (the only major output of water).